HB and I have found a great couples devotion. Every Saturday morning we start our day on the porch, with coffee in hand, as we dive into some positive and, often times, very deep conversations about us and life. It’s apparent to me, that we will have periods in our life where everything is just clicking into place and then, all of a sudden, the well runs a bit dry and we’re left standing there wondering, “What happened?! But, it’s true what they say…”God will meet you right where you are.” I know this because, in my weariness, He’s met me here and has assured my heart that I’m still okay. In fact, I believe He’s wanted me to have a little rest so that I can recharge, reflect and refocus. Going forward looks very different from what I left behind…a concept that is sometimes hard for me to grasp because I often want what I had. I think we all have some moment that we want to return to, but life is always in forward motion so pining after “that moment” leaves us feeling discouraged and empty. I can see now, that I’m often guilty of setting the bar. Instead of just following His lead, I take it and run off ahead. When I remove Him from the equation, I begin to either feel overwhelmed or discouraged, like I’m somehow letting Him down. The truth is, I’m letting me down, because I didn’t reach “my” expectation. His feelings never change for me. Why can’t I grasp that?! But as I continue to move forward, I’m seeing His thumbprint on what is ahead and so I move along, slowly for now, keeping the eyes of my heart on Him. I’m trying to focus on simple truths like,…”Be still and know that I am God.” And “My yoke is easy and my burden is light.” It’s becoming clearer to me, that “my way” can lead to stress, chaos, and feelings of being overwhelmed and discouraged. But, over and over again, I feel what’s being impressed on my heart is that His way is fulfilling and simple. Period. If you feel like you’re floundering and overwhelmed with “stuff,” I would encourage you to focus on those two simple truths. Just be still, calm your heart, and lean on the assurance that He is God and in control. If your day(s) begin to feel insurmountable and chaotic, I would encourage you to do a “bar check.” and ask yourself, “Who’s setting the bar? Is this God’s bar – or mine?” and then, readjust, as needed. Just remember…His way is fulfilling and simple. 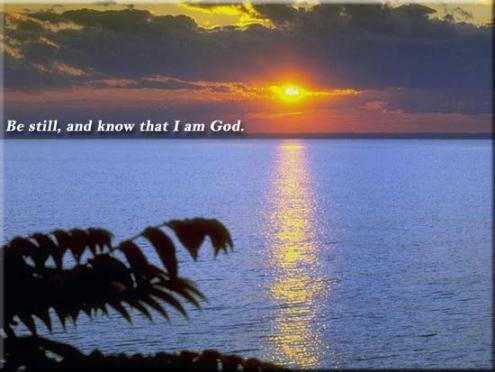 This entry was posted in The Journey and tagged be still, faith, God, promises, truth. Bookmark the permalink.